Organic Wooden Teether. Beech Dinosaur Teething Toy. Hand-carved Teether. Natural Baby Toy. Eco Friendly Infant Toy. Newborn gift. 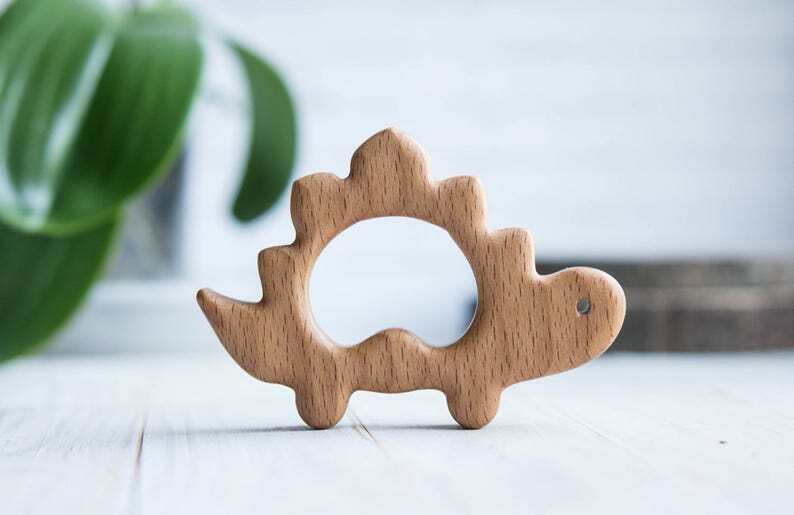 A wooden teether dinosaur made of beech and covered with linseed oil is the ideal first toy for babies to grasp and chew. Sanded perfectly smooth. A unique gift for new parents and their new little ones. The price is given for one teether. -	taste for beauty and love for Nature. Wooden toys fill our children with live energy and warmth because they are made of a magic natural material - wood. Being hand-carved and hand-painted the toys have individual peculiarities, they help to inculcate in children a taste for natural beauty. Wooden toys are simple, but through simple shapes they help children to discover their own creativity, use their imagination to the full and compose endless number of games. • All of our toys are made from organic, natural materials and non-toxic child safe finishes and paints. • This item is handmade and may be slightly different in wood grain and tone from what you see in pictures, you get a unique piece! • Avoid bumps and falls onto a hard surface. • Toy not standing up on its own. • Babies should always be supervised while playing with adult and be never left alone! Organic Wooden Teether. Beech Horse Teething Toy. Hand-carved Teether. Natural Baby Toy. Eco Friendly Infant Toy. Newborn gift. Organic Wooden Teether. Beech Elephant Teething Toy. Hand-carved Teether. Natural Baby Toy. Eco Friendly Infant Toy. Newborn gift. Organic Wooden Teether. Beech Unicorn Teething Toy. Hand-carved Teether. Natural Baby Toy. Eco Friendly Infant Toy. Newborn gift. Organic Wooden Teether rocket . Beech Teething Toy. Hand-carved Teether. Natural Baby Toy. Eco Friendly Infant Toy. Newborn gift. Organic Wooden Teether. Beech Star Teething Toy. Hand-carved Teether. Natural Baby Toy. Eco Friendly Infant Toy. Newborn gift. Organic Wooden Teether. Beech Teething Toy. Hand-carved Teether. Natural Baby Toy. Eco Friendly Infant Toy. Christmas gift. Newborn gift. Organic Wooden Teether. Beech Monkey Teething Toy. Handmade Teether. Natural Baby Toy. Eco Friendly Infant Toy. Newborn gift. Organic Wooden Teether. Beech Snail Teething Toy. Hand-carved Teether. Natural Baby Toy. Eco Friendly Infant Toy. Newborn gift. Amazing quality product, quick responses, honest sellers. Splendidi, ben fatti ed esattamente come descritti! We only accept Pay Pal. You may pay via PayPal with your credit or debit card without having a PayPal account. • Your order will be shipped within 3-5 business days after payment. All packages are sent via international registered airmail from Magnitogorsk (Russia). It includes identification number ( it will be sent to the e-mail notification ). • We send items to the address provided in Etsy. Please make sure your Etsy address is correct when you checkout! • Please note, shipping time may vary depending on your location and customs processing, so I can’t guarantee that items will be received by a certain date - it's out of your control. The transit time will also be affected by any busy season (e.g. Christmas) or your local holidays. CHRISTMAS LEAD TIMES MAY INCREASE BY AN ADDITIONAL NEAR ONE WEEK. We will send all shipments to this address and NOT your Paypal address. You can change shipping address after purchase if your order has not been shipped. Please, convo us with the correct address as soon as possible. In case of incorrect shipping address you order may be sent back to us or even misdelivered. We are not liable for such kinds of mistakes. If you have not taken the time your order with postal office and your package was returned to us as unclaimed we'll contact you for further information on delivery or canceling an order. In this case, the buyer pays the shipment. If your items didn't arrive within 45 days, contact me and I will log an investigation through Russian Post. Once this is completed, they will contact your country Post and will both conduct an investigation in an attempt to locate your package. If the package is officially recognized lost, 100% refund is guaranteed. If you are not completely satisfied, we are happy to accept returns. Shipping costs and state taxes will not be refunded. After the item has been returned, the original purchase price will be refunded to the customer via PayPal. Customers are responsible for the cost of shipping the item back. Unfortunately we do not accept wholesale orders. Wooden toys should be cleaned with a damp cloth, then wipe them and them dry. If after that the surface remains rough, we recommend to treat toys with fine sandpaper and topthem with linseed oil, since it has antiseptic properties and protects wood from external influence. Organic Wooden Teether. Beech Dog Teething Toy. Hand-carved Teether. Natural Baby Toy. Eco Friendly Infant Toy. Newborn gift. Organic Wooden Teether. Beech Teething Toy. Hand-carved Teether. Natural Baby Toy. Eco Friendly Infant Toy. Organic Wooden Teether. Beech Teething Toy. Wooden bird teether. Natural Baby Toy. Eco Friendly Infant Toy. Baby shower gift.